I’ve been using the FT-817 for most of my SOTA activations until recently but now that Solar Cycle 24 is declining and ionospheric conditions are becoming less favourable, I’ve found that a little more transmit power is helpful in overcoming the weaker signal strengths and deep fading. The Barrett 940 has had several outings in recent weeks and has given a good account of itself in less than perfect HF conditions while operating portable from SOTA summits. My 940 is unmodified but I have programmed it specifically for my needs, which focus primarily on SOTA portable operations but also include the VKS-737 channels for emergency working via the 4WD network. I am happy to report that I’ve never needed to use those but it’s comforting to know that they are available “just in case”. Here’s what I’ve done to set up my 940. The 940 can be programmed using PC-based software, and some parameters can also be programmed from the front panel. The scratch pad channel (200) can be overwritten any time I wish, so that when I encounter a frequency on which I want to transmit but that isn’t already programmed into a memory channel I can quickly put it into that one. This is a slight drawback of using a channelised, commercial-specification transceiver on the Amateur bands, but in practice I’ve found it easy enough to work around. I included the IBP beacons so that I can check propagation. Often I’ll leave the radio scanning these channels while I’m having lunch, so when I go back on the air I’ve got an idea of what bands are open and to what parts of the world. The 940 has CW as one of the available operating modes. It implements this as J2A using upper sideband, a technical nicety that is really of academic interest only. Most Amateur transceivers do something similar, though they often offer the option of reversing the sideband in use which can help to shift away from interference. In my opinion it’s easier to QSY a little! There are a couple of methods of connecting the CW key to the radio and I have elected to use the 5-pin socket for this, since nothing else is connected there. This gives me the option of simply omitting the key if I’m not planning on using CW. Unlike most current Amateur rigs, the 940 does not have a built-in keyer. I’m using a CodeCube from Palm Radio which does a great job. 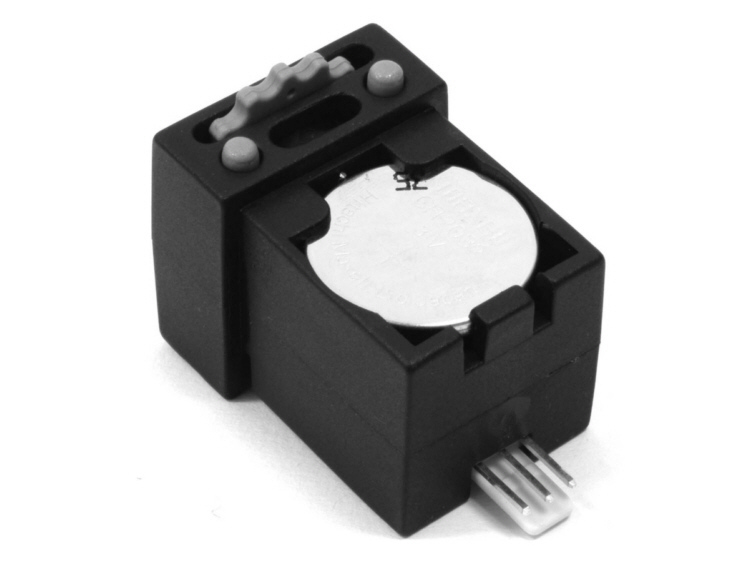 It’s physically very small and light, and it has a speed control knob that makes it very easy to change the keying speed as needed. It also has a number of memories available, but I haven’t made much use of this. The obvious use would be to have a memory to call CQ SOTA at the touch of a button, so I could sit back and drink my tea while the rig calls CQ for me. I would do this but I’d have to change it often, because sometimes I operate as VK2IB/P (in NSW) and other times as VK2IB/3 (in Victoria) and occasionally AX2IB with /P or /3 (Australia Day). It’s easier just to key it manually. 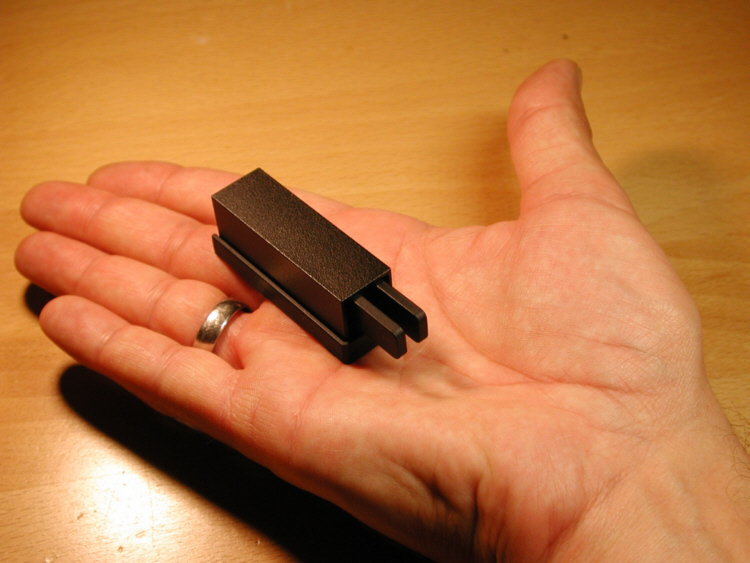 I use a Palm Pico paddle, which is very small and has a magnet on its base to attach it to a solid surface so it doesn’t wander around when sending. I stick it to the metal bar on the clipboard that holds my log. That way I can send with one hand while waving the march flies away with the other, a very important point to note when operating in the high country in summer. I have a pile of original NiMH batteries for the 940, all of which are long dead. I discovered that inside the battery case, the batteries are held in place by a thick layer of epoxy potting compound. It’s possible to drill a small hole at the corners and punch this out, leaving an empty box complete with clips to attach it to the rear of the radio. The box is way big enough to accommodate my 8400mAH LiFePO4 battery, which is way lighter than the standard battery and has plenty of capacity to power the radio for a good day’s SOTA operating. 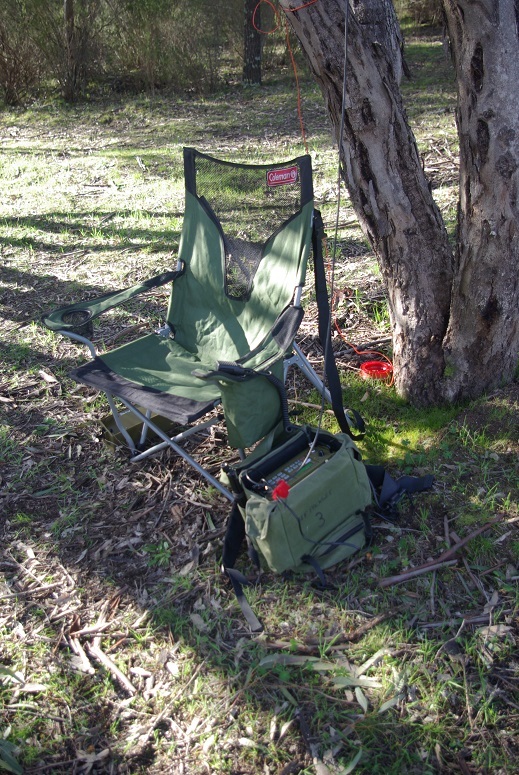 The Barrett 940 comes with a clip-on automatic ATU, a 10-foot folding whip antenna and a 10 metre wire. With the ATU, the whip can be used on frequencies from about 5MHz upward while the wire can be tuned on all bands from 1.6 to 30MHz. Of course, the efficiency of these antennas can be quite low, particularly on the lower HF bands where the antenna is a tiny proportion of the wavelength. I have constructed a three-band link dipole that’s cut for 7, 10 and 14MHz and this can be used with the 940 simply by disabling the auto ATU. The ATU can be disabled through the radio’s configuration menu, which is accessible from the front panel. The antenna connects direct to the transceiver and it’s only necessary to remember to select the correct links for the band in use. For the other bands I have a 40 metre long wire which the ATU can match with a respectable SWR to the transceiver, and this seems to work reasonably well. The ATU can achieve a good match to this antenna in a couple of seconds on every frequency I’ve tried it on.